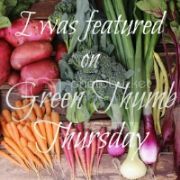 The Green Phone Booth: Advice on No-VOC Paints? Katy Farber of Non-Toxic Kids loves Mythic Paints. Diane MacEachern of Big Green Purse says: "I painted my entire interior, one room after another, with Pure Performance from Pittsburgh Paints. LOTS of colors, no VOC, though I think it may have a couple of ingredients that something like AFM or Anna Sova (milk-based) don't. The paint has held up for several years. I never got a headache for the couple of weeks it was being applied. It cost me about $600 more to paint my whole house (8 rooms, plus two bathrooms) with Pure Performance. All the painters had "painter's cough," so I was glad to give them a break from the stuff they usually use." I love Diane! She even gave me specific hardware store recs. And I SO don't want my kids to end up "painter's cough!" Tiffany from Nature Moms Blog loves Lovo Paint: "Very high quality paint and zero smell." Anna from GreenTalk had buckets of advice: "We actually used Benjamin Moore's EcoSpec when we painted 4 years ago as well as AFM's primer. AFM Safecoat is made for people with chemical sensitivities. (They have paints as well.) It is amazing primer. When you put it on it is like covering your walls with white paint. You can only get it at certain green building places or online. We were told that it would lock in the chemicals from the drywall and spackle. The one we used was only for new drywall. They may have one for covering up dark colors as well. EcoSpec is readily available, decent price point, and the color is what it is. If I need a gallon, I don't have to order it on the web or run an 45 minutes away to the nearest green store. Since then BM has come out with Aura in all colors and Nativa is coming out this Spring which is supposed to be a no VOC paint. Aura is expensive but supposed to be a one coat paint. Most painters I talk to still use 2 coats with this paint. However, with dark colors you may need 3. Since then, I have tried Home Depot's Freshaire, which is not bad but is limited in colors. No VOC. Also, tried Ivy Coatings, a no VOC paint. Liked it as well. Sherwin Williams has a lot of great paints too. They say their paint is scrubbable which may not be a bad idea for you with little kids. Harmony, I think it is called. Never used the milk paints or Yolo. Like I said before, I like convenience so I go towards being able to run over and pick it up. Plus, I like consistency. I want to know that the color that I have is the color that I will get. I also tried to get little bottles to try the color on my wall or on a white poster board before I purchased the color. Color looks really different during the day and night. Each house is different too. I could love a color and try it. Then realized it was awful in my house. I also like going with a paint company that has lots of color choices. I think Yolo actually send you the big swatches. Check." Could these women be any more generous with their time and expertise? Sheesh! I am so appreciative. My kids can run to the playground while I paint but we're not moving out, so I want to do all I can to make sure the paint fumes are as safe as I can make them. Dude! So many choices and I haven't even started to think about colors! Weigh in if you've got a low-VOC paint you love (or hate). 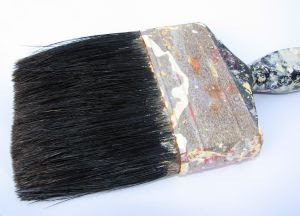 Or even if you have any painterly tips for this rusty ol' brush. Wish me luck on the spackling! We used Benjamin Moore's Aura to paint our bedroom in December (had some mold issues). It's a wonderful paint and you really only need one coat. The colors are beautiful and go on so smoothly. No smell, would use again and again. We use Best Breathe EZ Paint, Zero-VOC with no biocides, and they are local to us. I have used Aura and Mythic paint within the last year and loved both. Aura is just incredible for coverage, which meant a quicker job and hopefully 10+ years before I have to go thru it again! Plus it's available at the Glover Park Benjamin Moore store, which is one of the friendliest paint stores around. I had to drive over to the 5th Street Ace Hardware to pick up the Mythic paint. They're friendly too, but I hated having to drive across town. Thanks so much, everyone! Lots of reading to do before I get to the spackle. We painted my son's room with the AFM Safecoat primer (not for new drywall) mentioned and then used AFM Safecoat egg shell white zero VOC with a zero VOC custom color. One of the tricks we learned is that although many white paints can be zero VOC, many of the colors are what actually add the volatile organic compounds, so ask lots of questions when picking colors. When deciding on paints I consulted with a local store called Planetary Solutions (they have a website and might phone consult: http://www.planetearth.com/services.html) and after trying lots of different paints prefer AFM (as of two years ago). My MIL is VERY chemical sensitive and they just had their house repainted with the Benjamin Moore paints mentioned, as that is what was available to them in Ann Arbor. So far they are very pleased with the results nor did she have a reaction to the paint, although they were out of town when the house was painted. The current issue of Organic Gardening (I think this is where I saw it!) covered no-VOC paints. I can check their rec's when I get home. Interesting and personally useful post! I'm getting ready to paint my little one's room. I did not realize there were so many products on the market. Thanks for laying some of them out here. What a great reference - the post and the comments! We've got some painting in our future so I'll bookmark this. I'm leaning toward the free stuff in the garage that would just end up in a landfill if we don't move it (and the colors match the first coat), but I'm willing to listen to suggestions! DeinDC - thanks for checking your mag for me! Jeanne - let me know what you decide. 2)Protecting your child's health - I would guess that you might want to err on the safe side by keeping your house well ventilated and moving your kids out of their rooms during the painting... but my (very limited) understanding of the dangers of VOCs are that it's the initial offgassing that's the worst. But you are the science teacher! You tell me! I think you get my drift. If it's just that initial offgas that's problematic, use the paint with no question. If there are longer term health implications, I'd freecycle the paint and buy new. Green Bean - agreed! love the info sharing all round. Crunchy Domestic Goddesss - tx for weighing in! Regarding Aura, the reason they said they use two coats was to make sure they don't miss anything. We used the Home Depot's Fresh Air product recently and were extremely disappointed with the coverage. We had to do at least two coats everywhere, so it took a long time. Also, the color comes in these little plastic bags that are supposed to dissolve, but they didn't dissolve completely so we had specs in our paint. I'd recommend trying a different brand. VOC Free paint is sometimes misleading. Any company can claim VOC free in the base if it is less than 5 grams per liter BUT they can add VOC’s right back with the colorant. It is important to note how each paint is colored. Dry Colorants are VOC free while many colorant methods out there are not. It is just adding all those VOC’s (you paid to not have) right back with the VOC loaded colorants!